All transactions are safe and secure with a reliable history in online purchasing behind each of our associates. 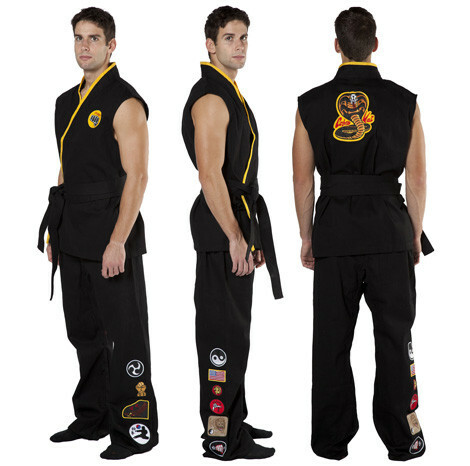 Buy the Karate Kid Cobra Kai Gi Costume to own Karate Kid clothing and merchandise. This Karate Kid Cobra Kai Gi is a heavy duty replica Karate Kid costume. It has been designed to match the original Gi worn by William Zabka (Johnny) in the Karate Kid movie. No detail has been overlooked, including replicas of the exact patches that can be seen on Johnny's pant leg. From the cut of the sleeves to the gold trim, each detail was included to match the original Karate Kid Cobra Kai costume, which was on hand during the design. Pair it with a Mr. Miyagi Karate Kid t-shirt. Wax on Daniel-san. In addition to the Karate Kid Cobra Kai Gi Costume above, browse the Karate Kid Clothing Gallery for more apparel like men's and women's clothes, kids shirts or hoodies.